We own and operate two manufacturing facilities in our home state of Wisconsin — located in Mequon and Columbus. 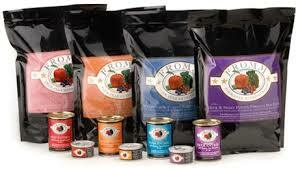 Every bag of Fromm dog and cat food originates from one of these facilities. Owning and operating our plants allows us to have full control over the quality and safety of the products we produce. This encompasses everything including, sanitation and pest control, facility maintenance, employee training, sourcing of ingredients, in-house lab analysis, preparation of meat and produce, formulation and blending, processing, packaging, warehousing and distribution. Part of the overall commitment we have to you — the pet parent— and to your pet is our dedication to producing high quality, safe and consistent pet foods. We have made food safety our highest priority and have implemented HACCP (Hazard Analysis & Critical Control Points) programs in our manufacturing plants. HACCP is a comprehensive preventative program used to identify vulnerabilities and establish documented controls to alleviate the potential issue. Our Approved Supplier Program ensures that ingredients have been tested by our suppliers and are secure and unadulterated until they are received at our plants. The ingredients are sampled and not unloaded until our own on-site testing labs can verify the safety and integrity of the received load. In process testing is also done at our labs to confirm our formulations are complying with guaranteed analysis as stated on our labels. All of our packaged pet foods are sampled and tested by an outside lab for pathogenic bacteria. The product is held and cannot be shipped until lab results are obtained and the product is cleared. This is the final step that ensures that all of our pet foods are wholesome and unadulterated. Every package of Fromm product you find on retail shelves includes a unique batch code which allows us to trace each product through processing, formulation and back to the individual ingredient supplier. Compliance to federal, state and local regulations is of the utmost importance. To ensure this compliance we perform audits of our procedures, programs and documentation on a regular basis. We are also subjected to random and periodic inspections performed by outside agencies such as the Food and Drug Administration (FDA), U.S. Department of Agriculture (USDA) and the Animal and Plant Health Inspection Service (APHIS).